With its striking appearance, Gutta’s BS rectangular roof will give older buildings a trendy makeover in no time at all. Our stylish canopy is available in two widths of 160 and 200 cm, either with or without side panels. The bauhaus style is back. Clear, straight lines with shapes that focus on the essential have experienced an impressive comeback in recent years. A classic design, a new life. Old buildings with an attractive appearance are just as much in demand as new buildings with cubic designs. 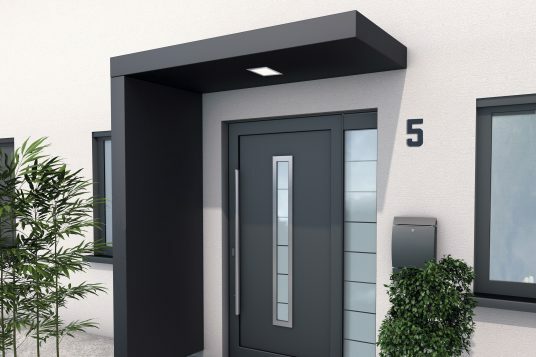 Add the finishing touch to your home with our new rectangular canopy, completing the architecture of your entrance area with a classic-modern design. 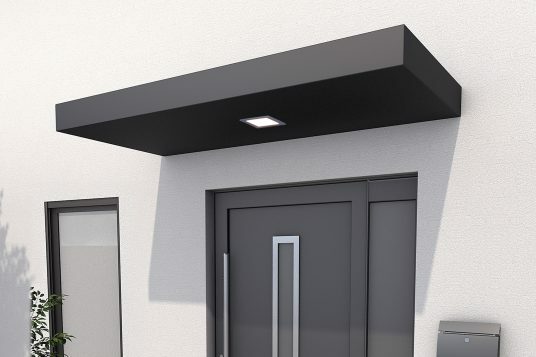 The canopy is made of anthracite-colored, powder-coated aluminium and a EPS insulation panels filling, ensuring maximum dimensional stability. But that’s not all: The canopy’s insulation padding minimises the sound of rain. 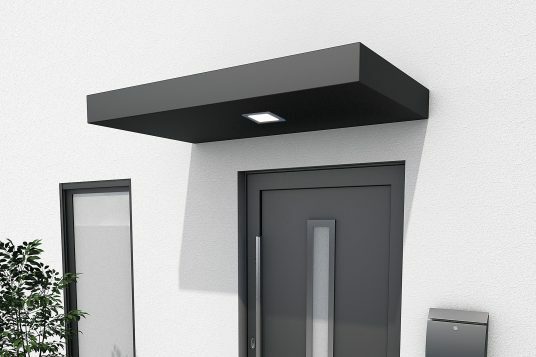 Another bright idea: the bright LED lighting that has been directly integrated into both models, which ensures that your entrance area is well lit with the lowest possible energy consumption. You thus save yourself the need for additional outdoor lighting. Our fashionable canopies become even more effective with the addition of attractive and versatile side panels. Experienced DIY enthusiasts can directly install a bell, intercom, letter slot and more. 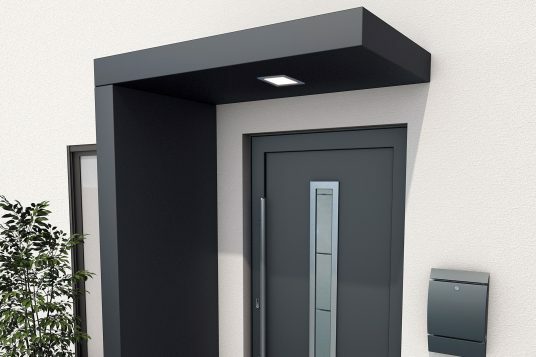 This turns the entrance into an attractive, multi-functional space. In the BS models, rainwater is drained off to the side via a strip. The BS Plus models have an integrated drainage system in which the water is drained either through a downpipe in the side section or through a water nozzle.